We’re frequently asked “What is COSHH?”. This post aims to answer basic questions such as “What does COSHH stand for?”. Read on for a COSHH definition, a guide to COSHH symbols and more. The HSE has a free downloadable guide called ‘Working with substances hazardous to health’ – which is a brief overview of COSHH. This guide explains that hazardous substances make thousands of workers ill by contracting lung diseases such as asthma; cancer and skin diseases such as dermatitis. As a result these diseases cost many millions of pounds to industry, society and individuals. The guide illustrates how you should assess the risk of your own COSHH substances and what control measures you should have in place to reduce employee exposure. 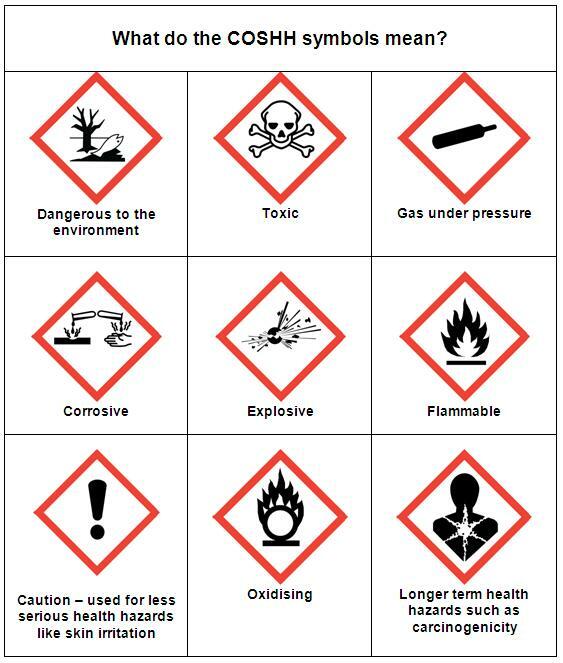 The hazardous substances mentioned above also have international symbols to allow you to understand the different hazards within your organisation. I hope that this post has answered some of your more basic questions. If you’d like to test your knowledge, why not have a go at our fun COSHH quiz. This is very informative post and i am waiting for this kinds of post. Thanks for providing such important information about coshh testing services.